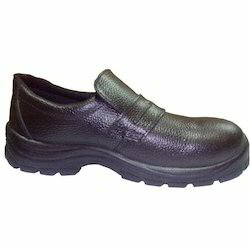 We are manufacturer and supplier of Electrostatic Discharge Safety Shoes. These shoes are Protective Footwear that prevent electronic products damage caused by static build up and offers protection against electrostatic charge generated by friction against the human body. ESD means Electrostatic Discharge. Electrostatic Discharge shoes is most suitable for clean rooms or static sensitive environment where static control is critical for the integrity of the products. Thus protective footwear is designed to reduce the accumulation of excess static electricity by conducting body charge to ground, while maintaining a high enough level of electrical resistance. Looking for Moccasins Shoe ?